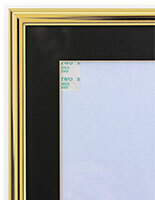 How does the metal wall framing keep its enclosed fine art prints free from harm? 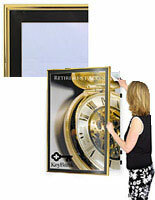 These gold poster frames are either equipped with plunge locks to secure the enclosures against theft & vandals. 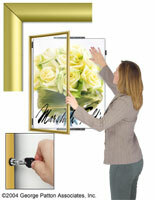 Other front loading, ready-made framing, while not a true locking holder, is outfitted with a gravity latch system that keeps the mount closed even if someone bumps into the wall. 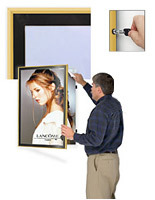 All of these gold poster displays come with a plastic lens that keeps the images or art prints inside them safe from the accumulation of dust and dirt and helps keep smudges from staying on prints. 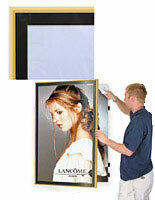 These ready-made poster frames are all front-loading styles. 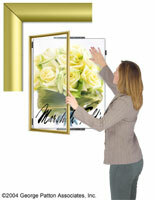 They feature doors that swing open to offer easy access to the images that are placed inside. Not only are the pictures simple to get to, but they are also easy to refresh. 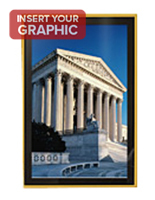 The backer includes reusable mounting tabs that hold the art prints in place without hassle. These mounts also have models that include black mats. The frames with thinner profiles are accompanies by the dark borders that really set off the yellowish color of the border and also create an interesting contrast to those pictures housed inside the displays. The black mat works well with the polished and the satin frames and that way customers get their choice of finish to best accommodate their room décor, whether that is at home of at the office. Because the yellow color appears to be more expensive and upscale the frames are ideal when used in high-end restaurants and country clubs. Theaters, both movie and live, well benefit from the beauty of the coloring as a great way to promote upcoming shows and events. Upscale boutiques and department stores find these polished and satin holders as great way to place the advertising of sales, clearances, and other store-wide events. These displays are perfect for many settings and look well in homes too. Use these affordable wall mounts in your living room to set off a favorite art print or in your foyer to display some fine art!